Residual product moisture content is a critical parameter when considering the stability and shelf life of lyophilized pharmaceutical product. Consequently, moisture analysis is performed in product and process development, as well as in commercial manufacturing to specify and control the maximum allowable moisture content. This is traditionally performed using Karl Fischer titration or thermo-gravimetric analysis (TGA) methods, which are destructive and labor & time intensive. Replacing these slow traditional methods with a rapid non-destructive method would streamline moisture analysis efforts and help improve the quality of finished product. Laser-based headspace inspection utilizing frequency modulation spectroscopy (FMS) is a rapid analytical method used for the analysis and inspection of finished sterile drug product. Quantifying the physical conditions in the headspace of sterile containers enables the monitoring of critical quality parameters and gives detailed insight into the process. In particular, quantifying the amount of water vapor in the headspace of freeze dried vials with an optical method enables rapid non-destructive moisture determination. Experiments have demonstrated that the amount of headspace water vapor directly correlates to the lyo cake moisture content. 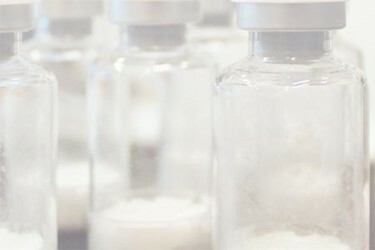 Stability studies have shown that the degradation of the active pharmaceutical ingredient correlates to the initial water vapor concentration present in the freeze-dried vial. These results indicate that rapid water vapor determination with an optical method could replace the slow destructive traditional methods for the moisture analysis of freeze-dried product. Industry applications of headspace moisture analysis described in this white paper include freeze drying cycle optimization, lyo chamber moisture distribution mapping, and 100% moisture inspection of commercial freeze-dried product.